New York City’s co-op and condo boards are starting to hurt as more of their residents get hit by the recession. In some cases, boards are being approached by owners looking to defer their monthly maintenance payments. “Lots of upstanding people have suddenly had the rug pulled out from under them … and obviously that’s going to present a threat to a number of co-ops,” said Marc Luxemburg, president of the Council of New York Cooperatives & Condominiums. 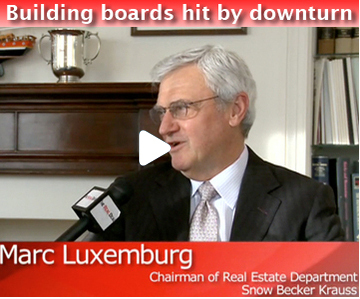 In this week’s Webcast, Luxemburg and Eva Talel, a partner at Stroock & Stroock & Lavan who represents co-ops and condos, talked to The Real Deal’s Jen Benepe about how building boards are coping with maintenance deferral requests and other new financial problems related to the economic downturn. To watch the full Webcast click on the video below.